Our basic seat is used in all of our seating systems. The interchangeable bases can be changed out using two screws. The lateral pads are all identical and can be used in any position, and the upper seat can be used with any lower seat. Our seat mounts to the factory seat pan on most major kayak brands. Each brand is unique, and requires its own base. We stock bases for Current Designs, Wilderness Systems and Old Town/Necky and we can design bases to fit more. The canoe mount version of the seat comes with a clamping mechanism that allows the seat to be quickly mounted to any flat bench seat. It also includes a seat pan that is designed to hold a cushion (see Cushions/Positioning). Our Universal Paddling Seat was designed with one purpose in mind: to open the sport of paddling to everyone. Regardless of the level of support needed, the seat provides as much or as little as the paddler needs. We fully outfit kayaks with our Universal Seat and outrigger systems, providing you a complete package to adapt to any paddler needing lateral stability. All of the components can be adjusted or removed individually, allowing for quick set-up for a wide range of paddlers. 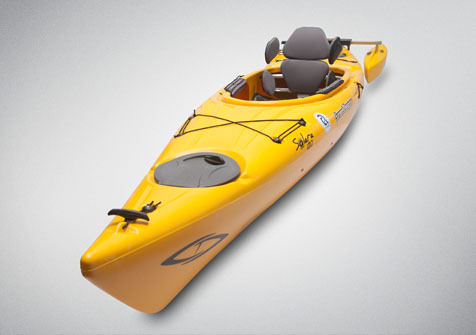 Our “Go-to” solo kayak is the Current Designs Solara 120 (shown here). We stock a full line of Current Designs kayaks. Please contact us for availability of other brands & models. Outriggers mounted to the back of a Current Designs Solara 120. 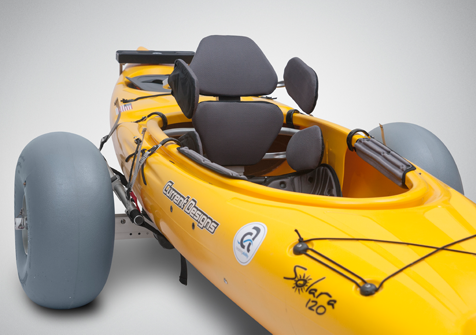 Our outriggers are molded in a variety of colors to blend or contrast with the kayak. Standard colors, shown left to right: red, yellow, mango, and royal blue. Our outriggers were initially designed and built by Spring Creek. Their designs are tough, well thought out, beautifully made (in the USA), and they are great people to work with. We take their original design and modify it to mount to the back deck of a kayak. The outriggers can be adjusted to two positions; either tight to the hull for maximum efficiency, or out from the hull for maximum stability. They are also easily removable, all with the push of a button. This unique design allows transfers on a flat level surface (like a parking lot) by positioning the cockpit rim at wheelchair height. With the paddler in the kayak, the rig can be rolled into the water and floated off of the chariot – making most water entry points (like boat ramps) accessible. Disassembles for easy transport. This easy-to-use system provides a flat, smooth transfer surface at wheelchair height when used with our Kayak Chariot. 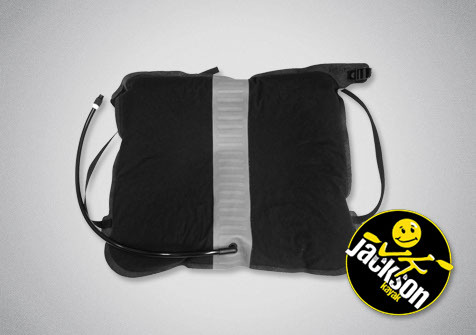 It provides independence for the paddler, and safety for those assisting in the transfer. 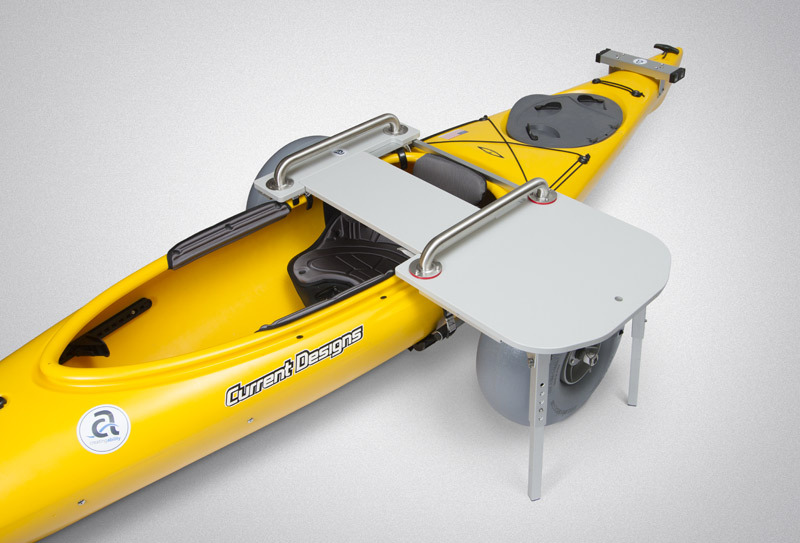 The paddler slides to a transfer board, positioned directly above the kayak seat. Adjustable handles enable the paddler to remove pressure from the transfer board, which is then removed – freeing the paddler to lower down onto the kayak seat. Cushioning and positioning are critical to skin safety and effective paddling. We sell Jackson Kayak’s line of products to create that. In particular we recommend the Sweet Cheeks 200 as a seat cushion, the Happy Seat (1 per leg) for leg/knee protection and positioning, and the Happy Feet for heel protection & foot positioning.